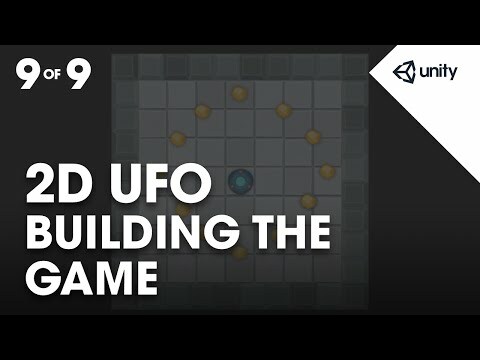 In this final assignment of the 2D UFO Game we'll make a standalone build of our game which you can play on your desktop computer. we need to present it to our players. to many of the current platforms available. we should save our scene. first open the Build Settings window. Shift + Command or Control + B. This brings up the Build Settings window. indicated by the Unity logo. options for the currently selected platform. We want to build a standalone application. PC, Mac and Linux Standalone. We do not need to change our build target. at the bottom of the window. to build to the Build Settings window. clicking the Add Current button. to include every scene in our project. with no scenes in the Build Settings window. current scene we have open for editing. Now we are ready to build our game. Let's click the Build button. asking us to choose a build location. we want to on our accessible drives or network. along side the Assets and Library folders. or library files, which could damage the project. relevant data and files in one package. and a data folder, which contains all of the necessary resources. And save the build inside it. and save it to our Builds folder. executable application, and now we are running our game. for them using simple scripting. We can collect and count objects.